Have you ever wanted to encounter all of your favorite superheroes at once? Yes, you can meet Marvel characters, at Disney Parks around the world, but there’s nothing better than meeting so many Marvel heroes at once while sailing the Disney Magic, one of the four amazing Disney Cruise Line ships. Whether or not you’re a Marvel fan, there’s something for everybody on Marvel Day at Sea. Marvel Day at Sea takes place on select 5-night Caribbean and Bahamas cruises aboard the Disney Magic. 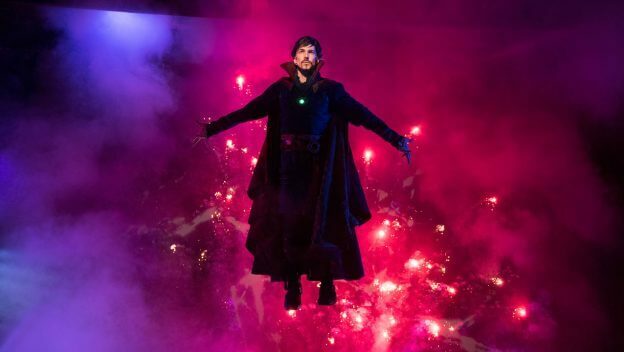 Guests aboard these special Marvel Day at Sea cruises will enjoy thrilling shows including “Doctor Strange: A Journey into the Mystic Arts” and “Marvel Heroes Unite,” as well as encounters with their favorite heroes like Spider-Man, Iron Man, Black Panther, the Guardians of the Galaxy and more. Guests can experience all of the magic and fun that comes with a Disney cruise combined with the entertainment and adventure of Marvel films and comics in an epic day-long celebration. Keep reading to find out everything you can discover in a day in the life on Marvel Day at Sea. When you wake up on Marvel Day at Sea, check your Navigator to see everything for you to discover throughout your day-long Marvel adventure. After breakfast, start your day the Disney way by meeting some awesome Marvel heroes, including Captain Marvel! Meet-and-greet opportunities aboard Disney Cruise Line are one of a kind. It’s a little different meeting your heroes aboard the ship than at the Disney Parks, and some of your favorite characters may require a reservation to help distribute the crowds. You can make character meet and greet reservations online before you set sail or, in some cases, checking with Guest Services while onboard will get you the tickets you seek. We suggest meeting some in the morning, and then keeping an eye on your Navigator to meet others throughout the day. Next, learn to draw your favorite Marvel heroes in Promenade Lounge before catching Marvel Origins in Buena Vista Theatre. Marvel Origins is a presentation all about how Marvel came to be, including the days before Marvel Legend Stan Lee. Did you know there are over 8,000 characters in the marvel family? This is a great show for Marvel fans who love learning more about the history of the franchise, but it’s also a great opportunity for those who are new to Marvel to learn all about it. For the ultimate Marvel fan, check out Marvel Trivia in O’Gills Pub in the middle of the day. This location is open for guests of all ages during Marvel Trivia, so you and your family can test your Marvel knowledge in a game of trivia. If you have kids, the morning is also a great time to drop them off at the Oceaneer Club, where kids ages 3-12 can participate in several Marvel-themed activities throughout the day. Disney and Marvel fans alike will love attending one (or more) of the Meet the Marvel Masters talks. These allow guests to hear presentations from Disney executives who give a glimpse into what goes on behind the scenes of Marvel and Disney. These presentations can include information about the Marvel attractions and characters coming to Disney Parks around the world, as well as background stories about how Disney and Marvel came together to create amazing films and theme park experiences. When we went on our cruise, John Mauro, Executive Producer of Walt Disney Imagineering, held the first presentation of the day. He shared Disney’s worldwide plans for expanding the Marvel universe in the parks and on the Disney Cruise Line, including these details we’ve previously shared. While I didn’t hear anything new that Inside the Magic hasn’t previously reported, there is no doubt the fan who hears the collective vision for Marvel expansion will marvel (pun intended) at the scope of future expansion at the Disney Parks. In a subsequent Marvel Masters talk, Brian Crosby shared how he became involved in with Marvel and a Disney Imagineer along with fascinating recollections of the Guardians of the Galaxy – Mission: BREAKOUT! and working with Joe Rohde in ensuring the new ride was much more than a simple overlay, but it told a story. My 11-year-old daughter joined me for both of the Marvel Masters talks and Brian was her favorite presenter given his storytelling style, while the reporter in me loved John’s presentation. No matter which perspective you possess, both of these presentations were highly informative and entertaining. 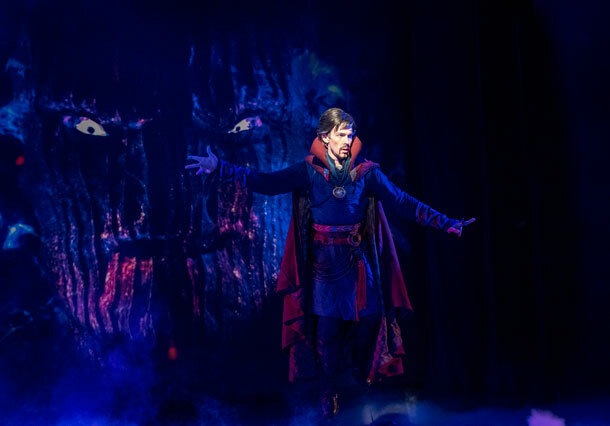 If stage shows are your favorite entertainment on a Disney vacation, then you’ll love the shows on Marvel Day at Sea. 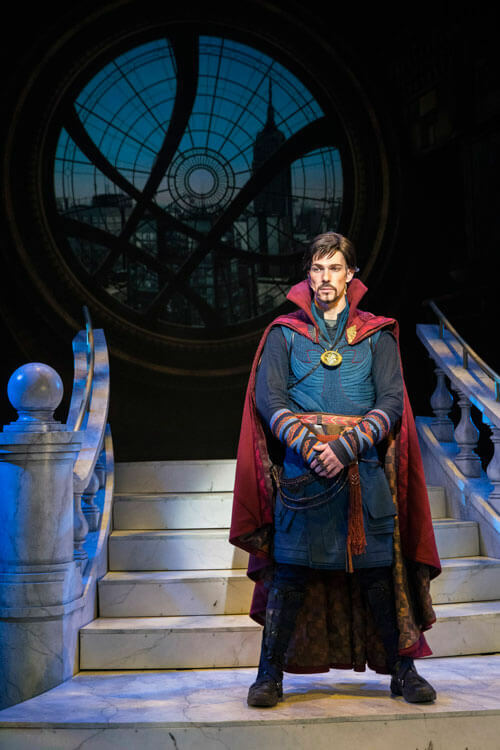 Be sure to watch Doctor Strange: Journey into the Mystic Arts, where you can learn from the Sorcerer Supreme himself. 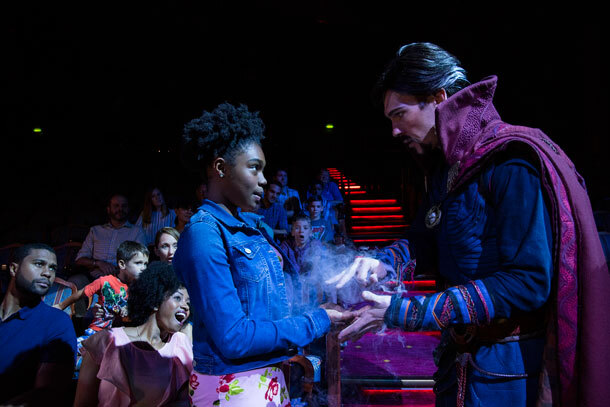 During this one-of-a-kind show, the Walt Disney theater aboard the Disney Magic is transformed into the Sanctum Sanctorum, the residence of Stephen Strange, and guests are given a lesson in the Mystic Arts before putting their skills to the test in a battle with the Dark Dimension. After this immersive show, how about a movie? Fun fact: you can watch unlimited Disney movies aboard Disney Cruise Line. And throughout your day on Marvel Day at Sea, you can watch Marvel movies and shows all day long. Animated Marvel series begin showing in the morning, and by the afternoon you can catch the latest Marvel live-action films. This is a great afternoon activity if you want to get your Marvel fix during your mid-day break before your night of adventures begins. And check this out: Disney Cruise Line premieres films at sea the same day they are released in theaters on land. So if you’re a movie buff, you can plan your Disney Cruise Line vacation during the time when a new movie is premiering, and you can catch it at sea! And just like in the morning, you can take a drawing class or even meet some more Marvel heroes (as well as Mickey and friends!) throughout the afternoon. The afternoon would also be the perfect time to pick up some Marvel-themed merchandise. This merchandise is exclusive to cruises aboard the Disney Magic that have Marvel Day at Sea. While the merchandise will be available for the duration of your cruise, there’s something special about getting it on Marvel Day at Sea, don’t you think? Take a look at some of the awesome merchandise perfect for the hero in all of us. Marvel Day at Sea is packed with amazing activities and surprises, but by the time evening rolls around, the real fun begins. Now it’s time to watch Mickey and Friends Super Hero Celebration, where all of your favorite Disney characters join in on all the Marvel fun. This show is fun for the whole family and perfect for fans of the Fab Five. Mickey, Minnie, and all of their friends dress up in outfits inspired by their favorite Marvel heroes, almost as if they are DisneyBounding! This show is a nice mix of Marvel along with the traditional Disney cast including Mickey, Minnie and the rest of the gang. For dinner, you can feast on a special Marvel-themed menu with dishes inspired by Marvel characters and a menu that looks like a comic book. The 3 dining rooms (Animator’s Palate, Rapunzel’s Royal Table and Lumiere’s) have been reimagined for the special day. Black Widow’s Cream of Porcini Mushroom Soup was excellent. Not sure Mushroom Soup is your thing? Give it a try anyway and if you don’t like it you can always ask for something else. That is one of the great benefits of a cruise: your appetite is the only limit to what you order. With all of the activities available during Marvel Day at Sea, I need to refuel like the Hulk so from the Incredible Hulk section of the menu. I went with the Grilled Delmonico Rib Eye Steak with Black Truffle Butter. This too was a good choice that is particularly appealing to all of the steak lovers out there, but in fairness, I would probably have been happier with something that took me out of my comfort zone a little more. We finished dinner with a nice selection of dessert options. Between the table, we shared Collector’s Warm Apple Crisp, Ravager’s Devil’s Food Cake and Awesome Mixed Sundae. Personal preferences when it comes to satisfying your sweet tooth will likely dictate your selection but of the 3 I would recommend the Awesome Mixed Sundae which I thought raised the bar beyond the description found on the comic book (menu). 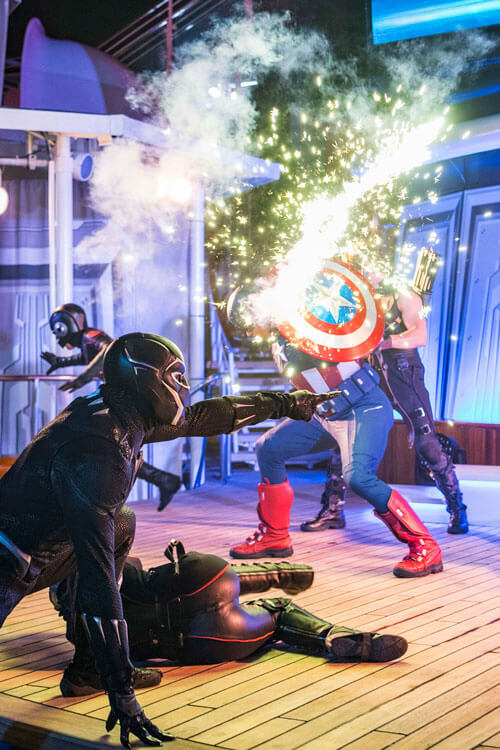 The most epic experience you will have on Marvel Day at Sea is hands-down Marvel Heroes Unite, the amazing show that takes place on the deck after 10 p.m. 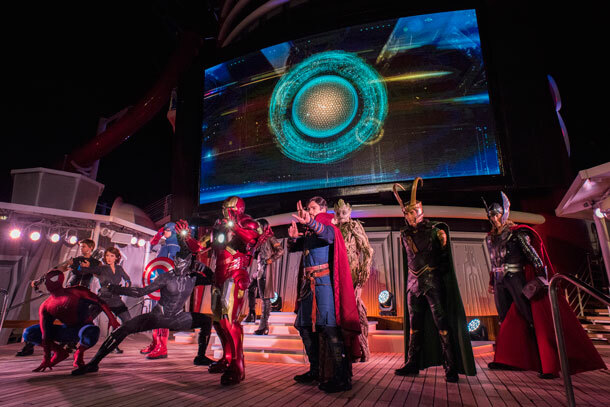 This is definitely worth staying up late for, as your whole day of Marvel fun culminates in an amazing show where all of the Marvel heroes aboard the Disney Magic come together. At Marvel Heroes Unite, guests are invited to join Tony Stark at his exclusive gala to see some of the latest technology from Stark Industries. He is joined by Captain America, Black Widow and Hawkeye before the villainous Loki interrupts. Loki and a team of villains battle our heroes before Thor, Spider-Man, Black Panther, Doctor Strange, Star-Lord, Gamora and Groot join the fray. We won’t spoil the ending (you’ll have to watch our video to see for yourself!) but we will share that seeing Marvel Heroes Unite was our favorite experience of the entire Marvel Day at Sea. The best way to think about this show is as its own mini-movie performed onboard the ship. So if you are a fan of Marvel (and who isn’t) you will definitely want to check out our video below, with a special appearance from Stan Lee. Marvel Day at Sea returns to the Disney Magic on select cruises out of Miami this January through April 2019. It will be back in 2020 as well. 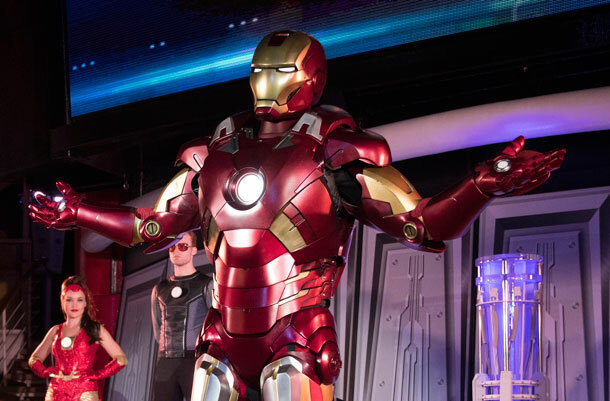 Take a look at Disney’s preview of what you can expect on Marvel Day at Sea on your next cruise. Will you book a Disney Cruise Line vacation so you can experience Marvel Day at Sea? Share your Disney Cruise Line vacation plans and memories with us!